It has been estimated that over 30 million Americans suffer from migraine	headaches due to bruxism (teeth grinding). This statistic indicates that	someone is in severe pain in one out of every two households. If you have painful migraines, teeth clenching may be the culprit that’s	causing the problem. Most people are either unaware they are grinding	their teeth, or they don’t realize the habit is causing their migraines. In addition to causing headaches, the force of constantly clenching your	teeth together also wears down tooth surfaces over time and can result	in fractured teeth, chipping tooth fillings, or eventual tooth loss. In	cases where bruxism threatens to destroy both upper and lower tooth surfaces,	the condition should be treated as soon as possible. Most teeth clenching occurs while you are sleeping. To alleviate this clenching,	we use a dental device approved by the FDA for migraine prevention called	NTI-tss. 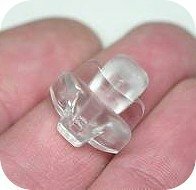 The oral appliance is a small bite-guard designed to be worn	over your front teeth to keep your front and back teeth separated –	thus minimizing clenching during the night. NTI stands for “nociceptive trigeminal inhibitory” –	a natural reflex that prevents us from breaking our front teeth when accidentally	biting on something hard. The appliance takes advantage of this reflex. The NTI appliance is fitted by your dentist. This dental appliance can	be custom fitted for the individual patient. 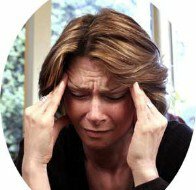 There’s no need to suffer from migraine headaches – help is	available. If you are experiencing symptoms such as a painful sore jaw,	an earache, teeth grinding that disturbs your sleeping partner, or tension	headaches –	contact one of our offices and schedule an appointment. At	Michael J Scoles DMD, we are confident that you too can get the relief you deserve.